We decided to put off a tour of the Parliament Building until next weekend, but stuck with our plan to avoid the downtown streets and buses, assuming the marathon would be causing gridlock throughout the city. Consequently, we spent the day off the streets by going first underground and then on the water. 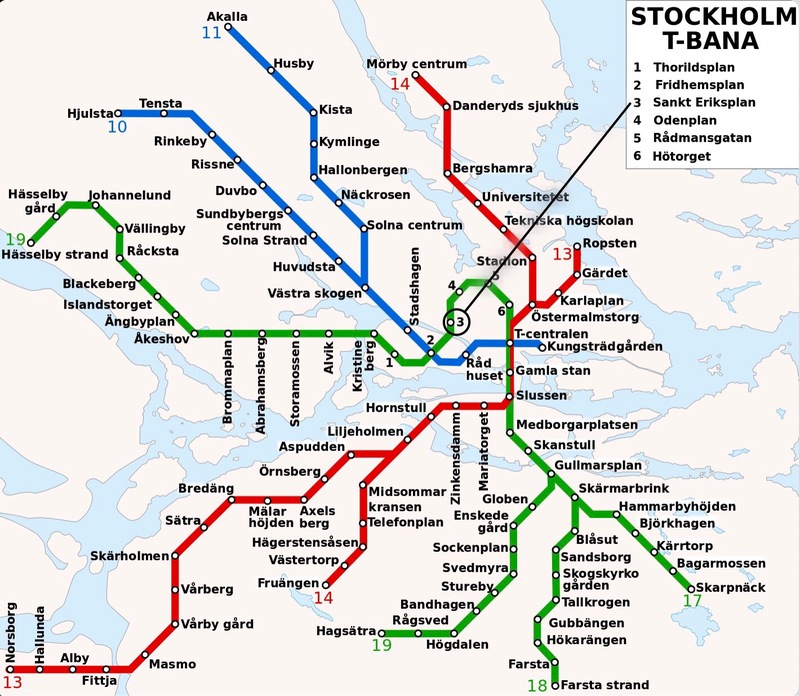 Stockholm’s metro is only a few years older than I am. Construction having begun in 1950, the “Stockholms tunnelbana” now consists of 7 lines with over 100 stations, half of which (including most, if not all, of the downtown stations) are underground. The tourist brochures characterize it as “the world’s longest art gallery” because nearly every station has been given over to one or more artists. 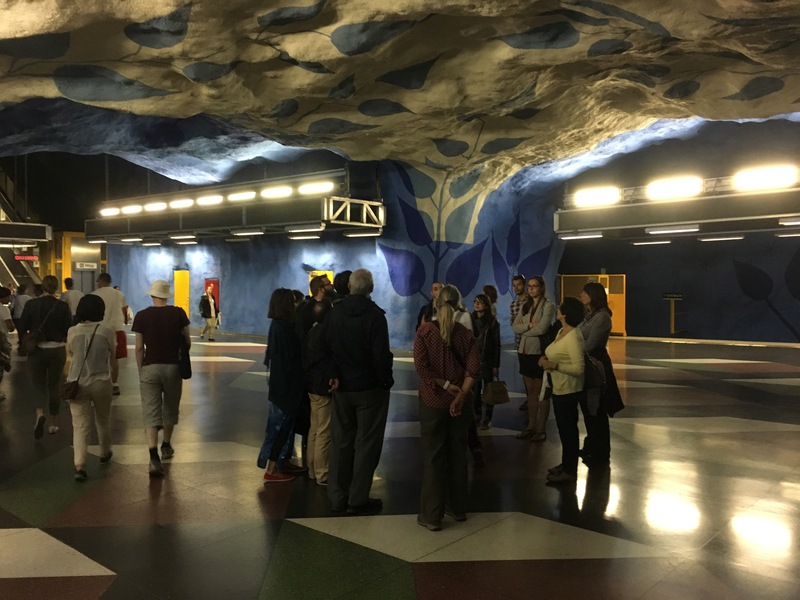 We are staying near the St. Eriksplan metro station, just four stops from the T-centralen, the main station downtown which is integrated into the central train station. 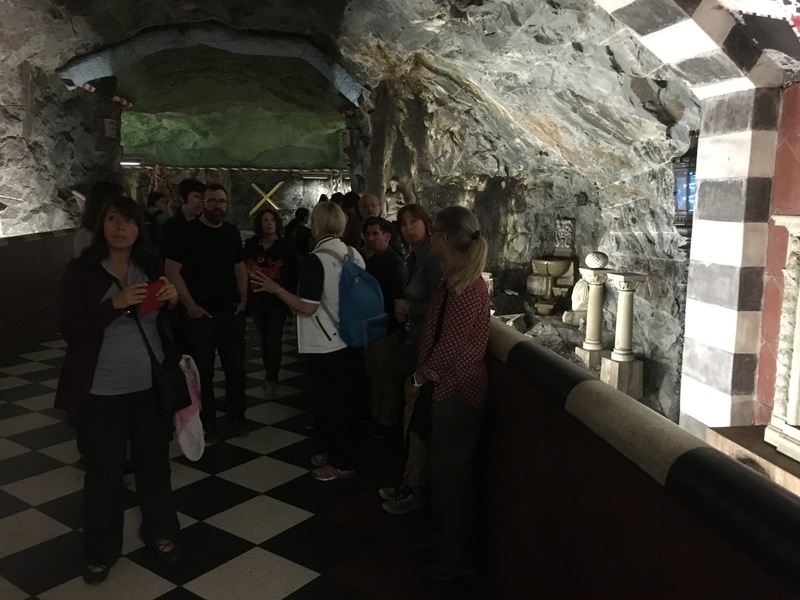 We headed there for a guided tour of several of the underground art exhibits. A number of the stations are left in a semi-unfinished state so that the excavation can be seen. We started the tour in one of them. 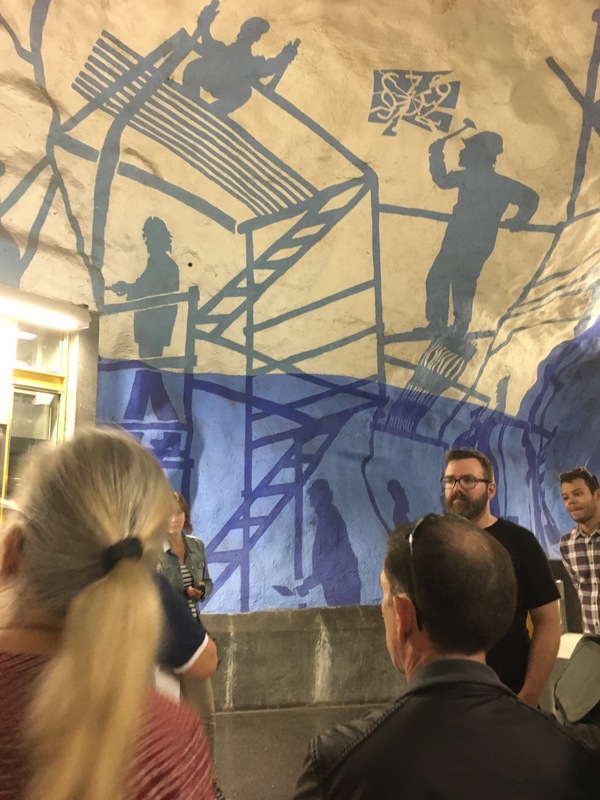 We then moved on to another station that was covered by a mural depicting the trades involved in the construction of the metro system. It’s not just the ceilings that are made into art exhibits; even the floors and benches are incorporated, as shown in the photo, below. Notice the green coloration of the rock behind the benches. Water oozes through the excavation in numerous places, allowing algae to grow. The station art is not limited to painting, either. There are a number of sculptures and scenes, such as this one depicting an ancient archeological dig. 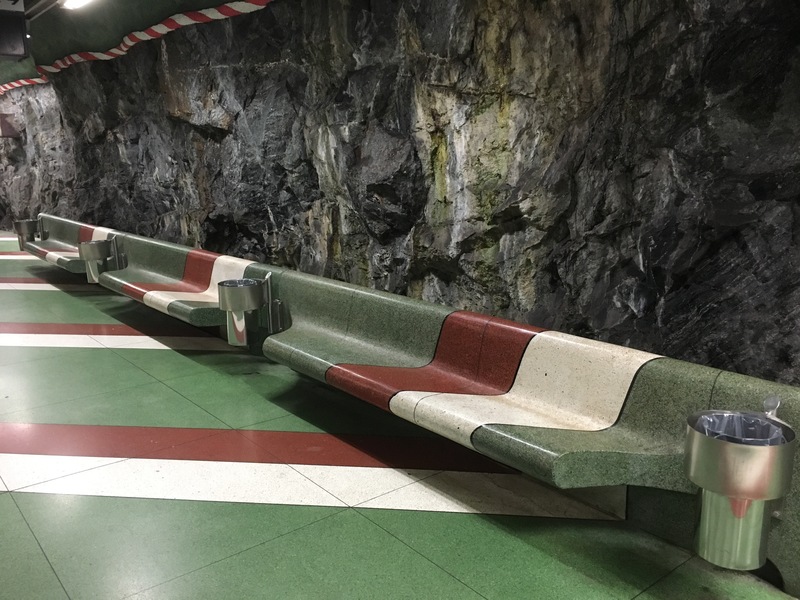 The Stockholm subway system is quite unlike any other we have ever visited on our travels. 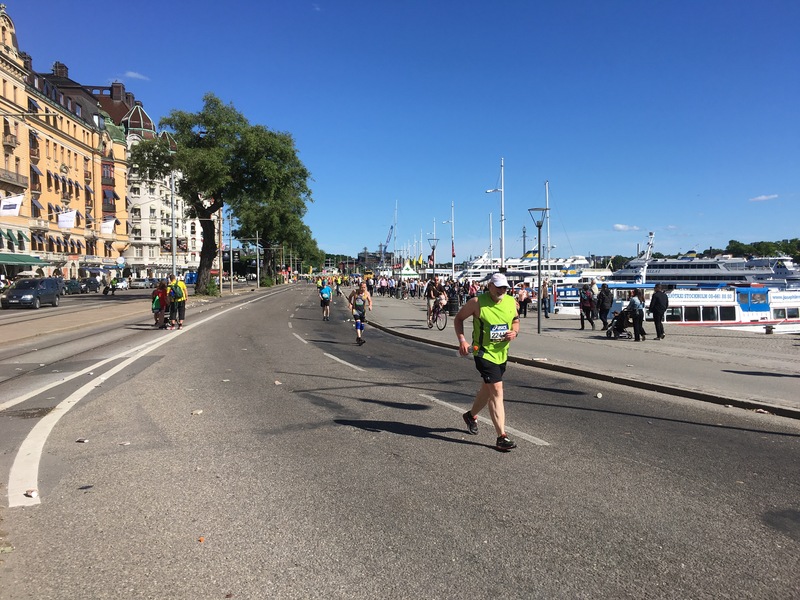 After the tour, we surfaced near the waterfront as the marathon was winding down. But the roads still looked closed, so we hopped on one of the nearby boats for the “Under the Bridges” tour. 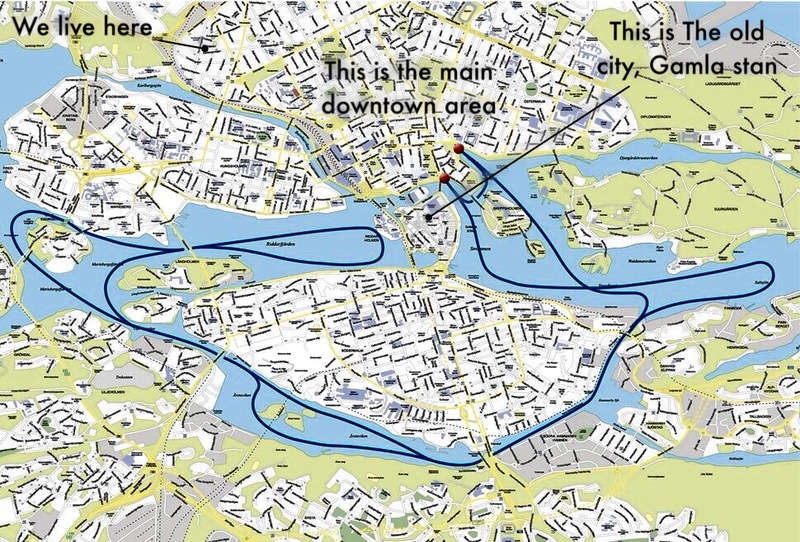 Here’s our route. 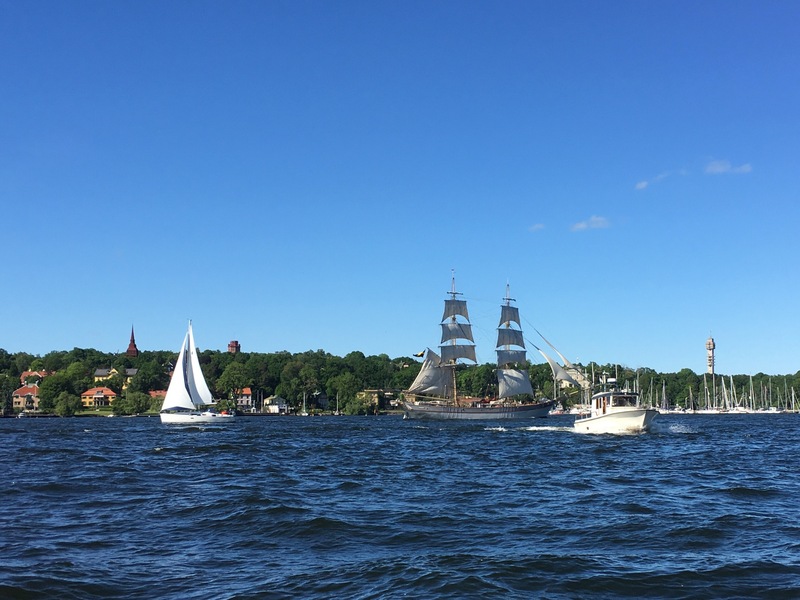 Perhaps another day, we’ll go out on the water again and I’ll have more pictures, but today we just enjoyed the ride. Here’s the only photo I took, shortly after we first left the dock. It was a nice day to be on the water. The marathon was over by the time we disembarked, 2 1/2 hours later, so we caught the bus home. It conveniently stops directly in front of our apartment. As we approached the front door, we were happy to see that the scaffolding that had covered the front facade of the building when we arrived a few days ago had been completely taken down and trucked away. The building owner is in the process of replacing all the front balconies, ours included. Looks like all that’s left to do is add the decking and railing. What fun to read your blog as we travel in the US. I thought you might be interested in knowing how most residential buildings in central Stockholm are owned. (re your comment “the building owner is replacing”). The building is owned by a “bostadsrättsförening” a legal entity. The residents purchase a share in the legal entity based on the size of their apartment, which gives them the right to use their apartment, and the shared amenities of the building. It also comes with the responsibility for the building’s costs which would include maintenance, mortgage, heating, etc. 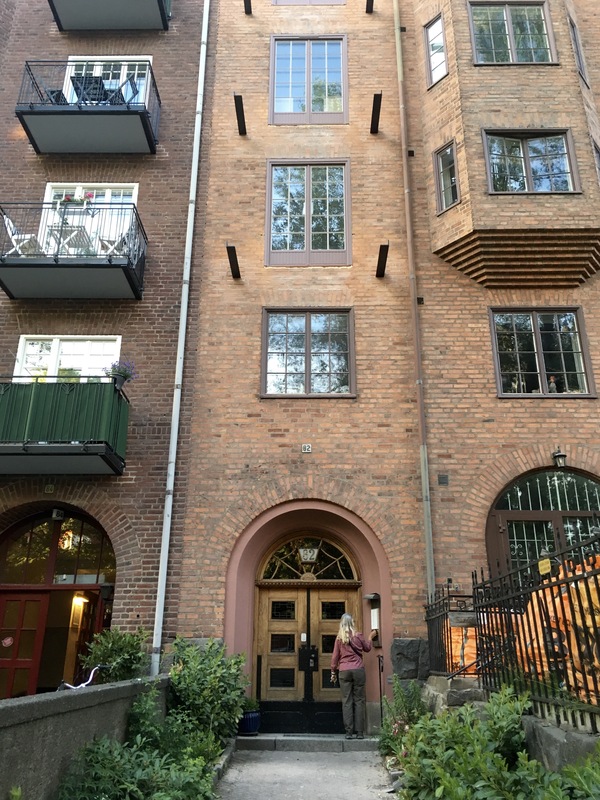 Re the balconies, it was previously not allowed to construct balconies at the front of older buildings as it was deemed to affect the cultural value of the property for the City of Stockholm. This became easier after a change in local government, so we applied and received a building permit. First we had to get the approval of the Bostadsrättsförening at an extra members’ meeting, and of course pay for the cost ourselves. Barbara, thank you for the info. I had assumed your building was a rental apartment, but now I understand it is more like a condominium or cooperative (a form popular in New York and Miami Beach in the 1900s).